The San Jamar MP19 ModPan™ ninth-size food pan offers a cost-efficient reusable container for food items. 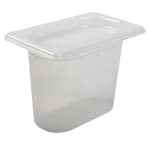 The 1-quart pan fits standard prep tables and features a clear polypropylene material to keep product visible inside the container. The material is impact-resistant and eliminates odors and stains from food. The material holds up to temperatures ranging from -10 to 204 degrees Fahrenheit. Its stackable design allows the pan to be easily stored. The San Jamar MP19 ModPan ninth-size food pan has a friction fit lid provided to keep food fresh and securely attaches to the pans. Also made of clear polypropylene, the lid matches the pan. A quick-release tab makes the lid easy to remove from the pan.